It’s that time of year that relaxing long soaks in the bath are pure luxury. Warm baths goes hand in hand with cold battering rain on the window, the awful weather you have just come in from after a hard day at work, picking up the kids, stopping at the supermarket for dinner, cooking dinner, kids bedtime. Who doesn’t need to submerge into a cosy bubble filled bath and breath?! When you just can’t get warm because the wind is howling through the house, fighting with the central heating making it a few degrees cooler, or you have been caught in the rain and the chill has set into your bones. A bath is the only way to get warm. I’ve seen myself on many an occasion heading for the bath just to get warm. Nothing else will do it. Then I’ll snuggle up on the sofa, wrap up in a cosy blanket and watch the next episode of, in my case right now, ‘This Is Us’. The cold autumn/winter weather also goes hand in hand with dried out body skin, as well as our faces. Another reason to relax in the bath (for at least 20 minutes, right?!) with your favourite bath oil, to allow your skin to absorb some of that essential moisture it needs. And then generously apply your favourite body lotion afterwards. I love it when I put my dressing gown on after a bath and when I put it on again the next morning I can still smell the fragrance, or when you walk into the bathroom an hour later and it still smells divine. It’s most therapeutic. Having a bath (with the door locked) is a perfect way to destress, to unwind with no computers, phones, anything else that falls into the technology category (unless you’re playing your favourite music to help you unwind) kids or demanding pressures. Create your own space, lie back and take at least 20 minutes of ‘me time’. A bathing elixir enriched with luxurious Italian rose and argan oils, leaving skin silky, supple and sensually perfumed. Pour your desired amount into a bath full of water, immerse yourself, close your eyes and deeply breathe in the luxurious essences. Gentle enough for frequent use, minute natural fragments of walnut shell buff the skin leaving it soft, smooth and healthy. 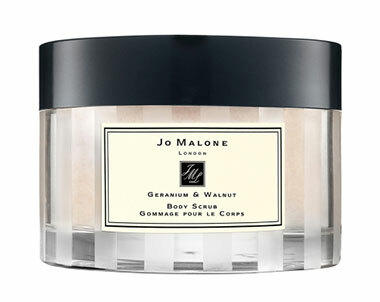 Crisp, vibrant Geranium is layered with the warmth of walnut. The scent was developed to complement each and every Jo Malone London fragrance. This classic scented moisturiser contains safflower seed oil, shea butter, apricot kernal oil and fruit extract. It is one of my all time favourite body lotions. This relaxing body treatment oil—with 100% pure plant extracts, including Geranium, Petit Grain, Camomile and Basil—helps relieve stress and fatigue for a total feeling of well-being. Hazelnut Oil locks in moisture to leave body skin soft and satin-smooth. Helps soothe tired muscles after exercise.